On Sunday, August 28th, one of my favorite Phoenix hotels, The Camby, celebrated National Bow Tie Day in grand style with the launch of their Weekend Brunch at Artizen, Crafted American Kitchen & Bar. A display of Ferraris from The Ferrari Club of America welcomed guests as they arrived. The brunch crowd were greeted with Tia Maria Bow Tie cocktails, a creamy blend of Tia Maria, dark rum, vanilla, and creme de cacao. 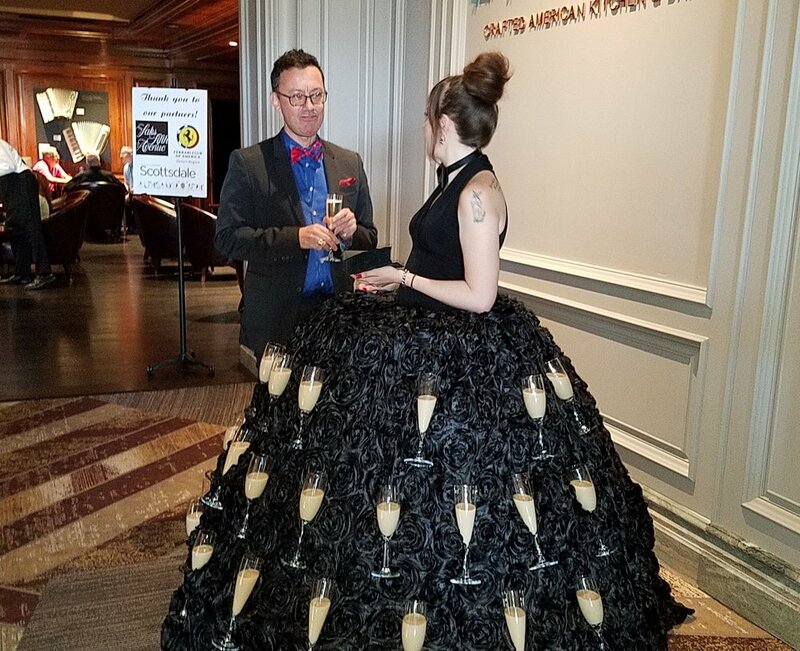 I joined my friendly group of food-lovers, the lovely ladies of Where Should We Eat and Phoenix Bites, as we settled in to enjoy brunch while being entertained by guitarist Jim Gregory (photo via AZ Foothills magazine here). Chef Dushyant's signature brunch menu included decadent lobster amd mushroom omelettes with truffle butter. A round of mimosas and peach-basil Bellinis were the perfect accompaniment to other winners on the new menu, such as the smoked salmon tower with lemon cream cheese layered on crunchy bagel chips, crispy blueberry-bacon waffles with bourbon maple syrup, poached eggs with asparagus and a fresh salad of local greens, and fish tacos with chipotle mayo and lime slaw. And since it was National Bow Tie Day, The Camby invited all to "tie one on." 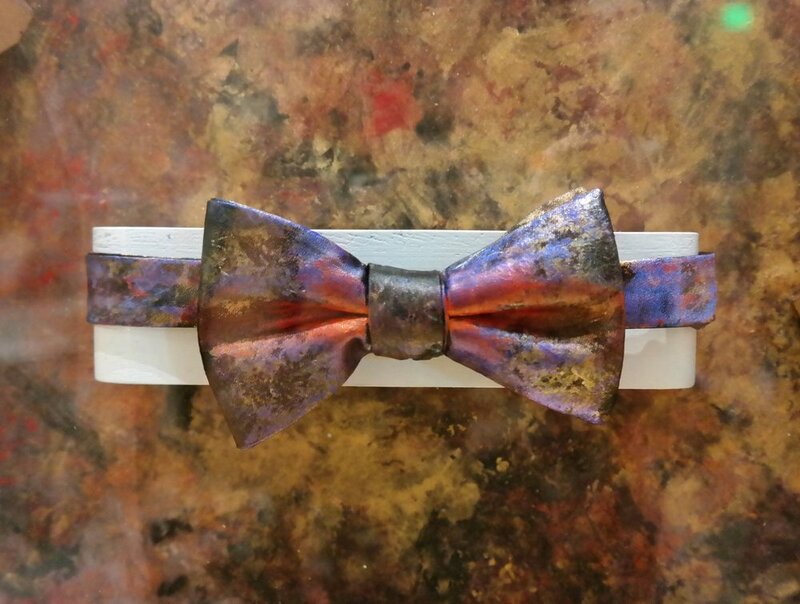 At noon, New York and Scottsdale-based artist Aleksandr Berki unveiled five bow ties in an upscale fashion show. Personally designed by chosen artists, each creation captured one of Arizona’s “Five C’s” and were made available for purchase at TheCamby.com: Arizona-based Skye Lucking (climate), Dale TerBush (copper) and Jillian Gifford (cattle) as well as New York-based artists Ben Copperwheat (citrus) and Michel Muylle (cotton). My husband and I were especially thrilled to meet Dale TerBush, a Scottsdale-based artist whose work we have admired and collected for years. As always, The Camby does everything in style. Weekend Brunch at Artizen is now offered every Sunday. Reservations can be made by calling 602-522-6655. I was hosted by The Camby and my experience was complimentary.